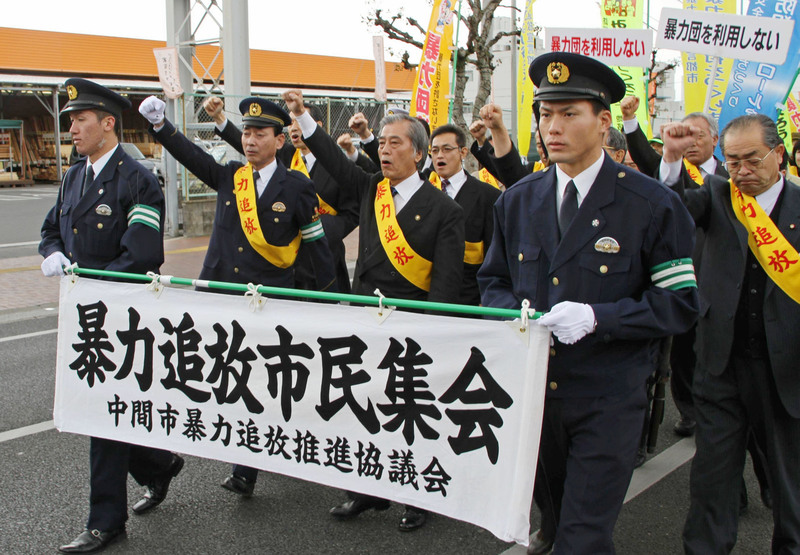 Gangland: Citizens of Nakama city, Fukuoka stage a demonstration against yakuza gangsters. Five months after tough new ordinances cracking down on the activities of organized crime syndicates went into effect, it’s not yet clear what impact, if any, they’ve had on gang activities. Kimura also vociferously denied allegations of his organization’s involvement in a bust in Fukuoka City last July, when police confiscated a number of military weapons, including an Israeli-made assault rifle. Kyushu, home to five major syndicates composed of 170 affiliates with around 3,000 members, has been embroiled in violent gang disputes for nearly five years. Conflict ignited back in August 2007, when Yoshihisa Onaka, head of the Kurume City-based Dojinkai, was assassinated by a shooter said to be affiliated with rival Omuta City-based Kyushu Seidokai. During 2011 alone, 18 shootouts occurred in Kyushu, half of which involved the construction business. On Nov. 26, 72-year-old Toshihiro Uchino, president of Hakushin Construction K.K., was shot to death outside his home in Kitakyushu. Veteran yakuza-watcher Atsushi Mizoguchi writes in Shukan Gendai (March 3) that while the current crackdown may ostensibly aim at encouraging yakuza to leave their gangs and go straight, the older members “… are aging and have no real skills, so many have no choice but to cling to the old ways.” For younger gang members, the future is decidedly bleak. Because the new antigang ordinances put the onus on ordinary businesses to refrain from business dealings with gangs, concerns have arisen that police may exploit ambiguities in the law and wield excessive power. 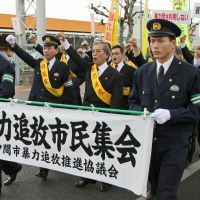 Writing in Shukan Kinyobi (Feb. 17), journalist Shunichi Narita points out in the seven categories of people with which companies should refrain from dealing, one of them — racketeers professing to be engaged in a social movement — appears to be aimed at members of rightwing groups, but the terminology is so vague it gives police the leeway to include anyone they wish, which would tread on citizens’ right to freedom of association. Narita also cites an example of how heavy-handed coercion is sometimes applied by the authorities. Students at a driving school in Nagoya were obliged to sign a form pledging they had “absolutely no ties to organized crime.” Unless they signed, they could not obtain certification from the school to apply for their driver’s license. In news mentioned thus far in only one weekly magazine, Shukan Jitsuwa (March 15), the U.S. Treasury Department in late February issued new sanctions banning U.S. citizens from making transactions with the Yamaguchi-gumi syndicate and two of its top members, whose American-owned assets were to be frozen. “The action to slap sanctions on the Yamaguchi-gumi seems quite unconnected to any political or financial goals that the Obama Administration might have for Japan,” explains Washington-based investigative journalist David E. Kaplan. “It is, rather, a result of the U.S. government’s top experts on organized crime finally getting Washington to focus on the world’s major criminal cartels, which have largely escaped attention during the ‘war on terrorism’ decade since 9/11. Kaplan, coauthor with Alec Dubro of the 1986 nonfiction work “Yakuza: Japan’s Criminal Underworld” — to be reissued later this year by the University of California Press — pointed out that the syndicates have largely avoided investments in the U.S. since the 1980s, but have expanded across Asia. In another development, last Monday, the government announced additional measures to crack down on the gangs. The Sankei Shimbun (Feb. 28) reported that revisions to the antigang law will add two new labels — “designated dangerous gang” and “designated disputing gang” — both of which will enable police to slap injunctions on the gangs, making it easier to prevent them from such activities as demanding payment of “protection money” by subjecting offenders to summary arrest. The Sankei also noted that since 1987, out of 24 civil lawsuits by local residents to evict gang offices from their neighborhoods, 21 have been successful (three more are still pending). The latest revisions will include new measures to protect residents and their attorneys from harassment by gangs named in the lawsuits.